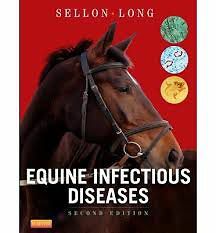 Ideal for both practitioners and students, this comprehensive resource covers the diagnosis, treatment, and prevention of infectious disease in horses. Organized by infectious agent  virus, bacterial and rickettsial, protazoal, and fungal  it includes complete coverage of the individual diseases caused by each type of agent. A section on clinical problems examines conditions such as ocular infections, CNS infections, and skin infections. It also addresses the importance of preventing and controlling infectious disease outbreaks with coverage of epidemiology, biosecurity, antimicrobial therapy, and recognizing foreign equine diseases. The most up-to-date coverage of equine piroplasmosis reflects what experts have learned as more outbreaks of this tick-borne disease have occurred in the US. Content on EHV-1 keeps you current on the diagnosis and treatment of this potentially serious disease in horses. Information on how global climate changes are creating more diseases in horses keeps you alert to the possibilities of new and emerging diseases worldwide. Expanded coverage of biosecurity on farms and in veterinary practices helps you develop an effective biosecurity program and emphasizes how to isolate or eliminate the source of infectious agents. Additional clinical algorithms offer detailed prevention strategies in addition to diagnostic and therapeutic guidelines. New appendix of product and diagnostic test kit manufacturers on the companion website, gives you access to the most current products and advances available in equine medicine.